This epic novel traces the origins and history of the islands of Hawaii, from their volcanic birth, through the first arrivals of humans from Polynesia, followed by European sailors and missionaries, then Chinese and Japanese laborers, to the modern blending of cultures. Michener writes in a clunky style and with mostly wooden dialogue--and yet I kept turning the pages and found this an amazing reading experience. I've read that Michener was an inspiration for both Rutherford and Uris, and I can see the family resemblance in novels of theirs such as Sarum and Exodus. (Even if Exodus was published before Hawaii.) By selectively looking at certain families and individuals, Michener attempts to tell the story of a place, the sweep of its history, and in all ways this novel screams epic. It's not a great book--but it is entertaining and at times thought-provoking. The opening phrase is "millions upon millions of years ago" and the first brief section, "From the Boundless Deep" tells of the formation of the Hawaiian islands and how life took hold there. "From the Sun-Swept Lagoon" tells of the peopling of the island in 813AD by stone age people from Bora Bora, the ancestors of the Kanakoas, whose knowledge of navigation and astronomy allowed them to travel thousands of miles--bringing with them breadfruit, coconut, taro, banana--and slaves. The next section, "From the Farm of Bitterness" was where I became enraptured with the book. It tells of the coming a thousand years later of the American Missionaries from New England in 1822. The later sections are more complex as other families, other cultures are woven into the narrative, and so those sections feel more dry and journalistic to me, and rarely do individual characters in those sections stand out. But here we have a more stark clash of cultures, between the Pagan Hawaiians and the Christian Americans--as well as the character I find the most fascinating in the book because of his tragic contradictions--Abner Hale, who is a mix of admirable, deplorable, and exasperating. When Abner opens his church, he chooses a slave as its first member and dares preach against the institution to the most powerful in the land, telling them this slave, this "foul corpse" has a soul equal to theirs. Yet to the end of his days he's incapable of seeing even Christian converts among the Hawaiians as anything but "heathen" and opposes intermarriage. He lovingly translates the Bible into Hawaiian--but won't allow his children to learn the language. The next section, "From the Starving Village" picks up in China, and deals with the settling of Chinese into the land brought in as plantation workers. Char Nyuk Tsin is the indomitable matriarch of the Kee clan and this section takes us through fire, plague, the leper colony at Molokai and how sugar was the driving force behind the coup against the Hawaiian monarchy and American annexation. "From the Inland Sea" brings in the Japanese through following the Sakagawas--and this was my second favorite part of the book, and among the most moving, as Michener depicts Pearl Harbor and the fight of Japanese Americans for full citizenship as soldiers fighting in Europe and then through one character takes us through a tour of the rest of Polynesia contrasting it to Hawaii. Michener lived through this era, serving in the Navy in the South Pacific during World War II--which might be one reason why he can bring the time and place so vividly to life. Michener's book starts us at the very beginning and then we see how the idyllic lives of the native are spoiled by the interference of well-meaning missionaries. Not always historically accurate, Michener still delivers a historical novel that moves us and convinces us we have seen the kernel of "truth." This is a true "guilty pleasure." I only read it once and won't read it again, but I gotta admit, it made an impact. Quite enhanced the movie. This is the first Michener book that I read and I loved it so much that I have read all of the rest of them with only a few exceptions. The quality writing makes it seem you are a part of the story. Good Michener historical fiction novel with a worthy subject. Since Michener was famous for his research, the historical authenticity should be reliable. I read this about three years ago, and I still enjoy reading it again whenever the urge strikes me. The book fairly accurately tells the story of Hawaii. The more you read the more you can learn about the people, history, and religion of these wonderful islands. The book does not portray Hawaii as a sunny vacation spot for rich americans, it's shown in it's true beautiful form. It starts when the Polynesians came to Hawaii, next other settlers came to Hawaii, and on to almost the present day. The first James Michener book i ever read, i think i was in the eighth grade or something, and it totally sucked me in. Over 1000 pages--took me about a week to read. The total history of Hawaii from formation of the island itself to modern days. I got 50 pages from the end and then packed it in. It's long. Really long. 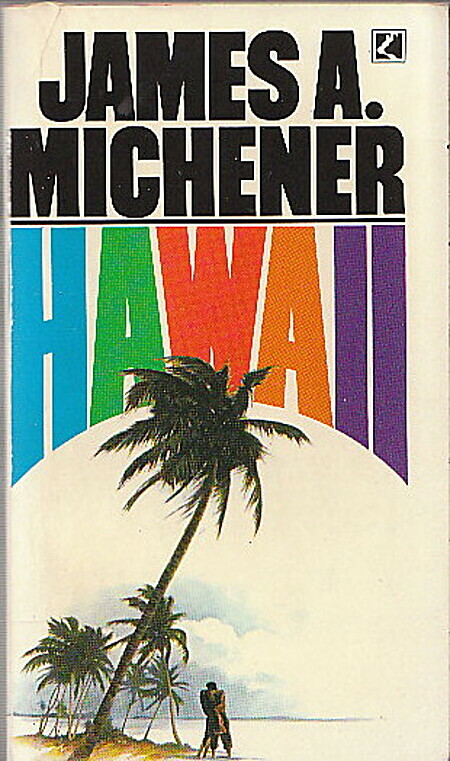 In fairness to Mr. Michener, I did like the most of the book but found the move into modern day Hawaii a little boring so I just quit. The first was the formation of the islands, before there was any animal or human life. It was a bit drawn out for me. Describing the volcanic action that caused the build up of layers, creating the actual islands. The second was the arrival of the people and the history and reason for them to come to the islands and establish themselves. This was the story of the people that became the inhabitants of the islands and became known as the Hawaiians. How they came to be there, their previous history and home. It again was a bit drawn out, but I figured that that was to impress the difficulty of their journey from their original home to this new one. The people were the ancestors of the Kanakoa family. The third was the arrival of the missionaries who came to 'civilize' the 'savages' by introducing the Hawaiians to Christianity and its lifestyle. Changing the original inhabitants' lives and beliefs to align with theirs. This involved the Hale, Whipple, Hewlett, Janderses and Hoxworths families. These families became the leaders and controllers of the islands. They basically overtook the Hawaiians' place. The fourth was the arrival of the Chinese and Japanese, who were brought over to work as slaves in the sugar cane and pineapple fields. Enticed with the story that they would only be there for a short while, save up a good sum of money and return to their homelands. Their lives were not easy, nor were they able to save up a good sum of money to return to their homelands. This brought in the the Kee family (China) and Sakagawa family (Japan). The fifth covers these families and how they have inter-meshed through business, land ownership and marriage. How their cultures existed side-by-side and also combined. It ends in the 1950s, having started in about the 800s. It is definitely not a quick read. Taking time gave me the ability to think about the people and what was happening to them and their world. I amy not have been there, but I felt that I had a little knowledge of what things may have been like. I don't feel that it was a waste of time to read this. I have read Michener before and know that he does thorough research and his writing is solid. Typical Michener. Detailed, thoughtful, spanning a long history in a digestible fashion. So far, I've read 18.0530973% percent of Hawaii as of 28 August 2009. I'm not sure if I'll finish it or not. Amazing and terrible all at the same time. On one hand, the research is astounding, the story complex, the historical accuracy fascinating. On the other, the characters are as deep as a paper towel, their motivations flat, their tone one dimensional. Proud to say I've finally read a Michener book, but boy was it a challenge. I love Hawaii and looked forward to learning about it. For that reason alone I'm glad I read it. Don't think I'll tackle another Michener though. Long as hell, but well worth reading. His characterization of Abner Hale, the original missionary, is excellent, even though the person himself is dreadful. I was given this as a Christmas gift prior to going to Hawaii for the first time, and it should make the trip more interesting. As with most Michener, I enjoy the beginning of the book but then get tired of the style. Another of Michener's fascinating epics about a specific place. I read Hawaii during my first visit there. It's a great story, with enough about each time period to present a fairly balanced view of the islands' history.